The National Fragile X Foundation serves all those living with Fragile X with a focus on community, awareness, and research in the pursuit of treatments and a cure. 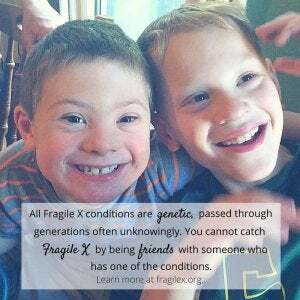 Fragile X syndrome is the most common inherited intellectual and developmental disability. An estimated 1.5 million Americans have the gene premutation, and an estimated 100,000 Americans have Fragile X syndrome. To increase public and professional awareness of Fragile X to influence public policy, support legislative advocacy, and increase funding for research. To fund and facilitate research that drives scientific and medical advances toward effective treatments and a cure. To assist and educate individuals and families living with Fragile X in all stages of life, through outreach and personal support. Stay up-tp-date on the conference and other Fragile X news by subscribing to our email list.